He believes in the principles and transcendental values of western christian civilization, as evidenced in his written work. 1. On July 1, 2010, the Venezuelan secret police (Bolivarian National Intelligence Service – SEBIN) apprehended at the Caracas international airport, a Salvadoran citizen named Francisco Chavez-Abarca. 2. The SEBIN commissary in charge of the intelligence sector, David Colmenares, said he had interviewed Chavez-Abarca and concluded that he was a “terrorist.” The report of this alleged interview, signed only by Colmenares (no witness, nor attorney present), indicated that Chavez-Abarca purportedly said that he had come to Venezuela to meet with Pena-Esclusa, who supposedly he had met months before in Honduras. 3. After this alleged statement, Chavez-Abarca was deported on July 7 to Cuba, where he has not been available for interrogation by a competent court, nor for obtaining additional evidence, as foreseen in the Venezuelan Code of Criminal Procedure (COPP), in order to safeguard the rights of the defendant Pena-Esclusa (violation of the “principle of control and contradiction of the evidence”). 4. On July 12, 2010, a task force of approximately 20 armed officers of SEBIN, performed a raid to the apartment of Dr. Pena-Esclusa, ordered by the Criminal Control Court No. 32 and assigned to the Attorney No. 24 of the Attorney General Office, based solely on the alleged statement by Chavez-Abarca. The raid was personally conducted by David Colmenares, the same commissary that purportedly interviewed the so called Salvadoran terrorist. 5. At the beginning of the raid, Alejandro Pena-Esclusa was handcuffed, in front of his wife and their three young daughters (violation of the “principle of presumption of innocence”) and held at the entrance hall of his apartment, where he was unable to observe the development of the search (violation of “principle of control and contradiction of the evidence”). 6. He was not allowed to be assisted by his lawyer, who was present at the front door (violation of “right to be assisted by counsel of in all stages and levels of the process”). 7. Along with the officers listed in the search warrant there were five (5) other officials, whose presence was not authorized either by the Court or by the wife of Pena-Esclusa (violation of “due process”). 8. Officials simultaneously raided every room of the apartment, making it impossible for the wife of Pena-Esclusa to supervise their activities, which enabled them to “add or remove” objects at will (violation of “principle of control and contradiction of the evidence”). 9. The officials who carried out the raid, said they found in a desk drawer of the youngest daughter of Pena-Esclusa, an 8 years old, a package with a material which was later defined as “C-4 explosive” along with detonators. 10. The identification of this material was made without Pena-Esclusa’s or independent experts’ control. No evidence was recorded in the “chain of custody” (Article 202-A of the Venezuelan Code of Criminal Procedure, COPP). This is why there are no traces that can guarantee today that there was really something in the apartment of Alejandro Pena-Esclusa (violation of “due process”). Nor there was an expert in fingerprinting to confirm whether there were impressions on the material. 11. 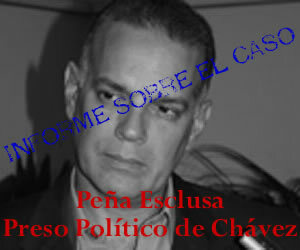 After the raid, Pena-Esclusa was deprived of his freedom, without court order (violation of “due process”). 12. The Control Court that heard the case was selected without following the due procedure of distribution of cases, and confirmed the detention of Pena-Esclusa at SEBIN’s headquarters. All this despite the fact that the Constitution guarantees a trial in freedom (violation of the “principle of presumption of innocence and due process”). 13. Venezuela’s background is filled with serious sanctions against judges who decide against the will of the Executive, who were immediately dismissed and some even prosecuted and deprived of their freedom. At the time of this report, Alejandro Pena-Esclusa has been under arrest for eleven (11) months with no scheduled trial date. He is charged with two counts of “conspiracy” and “concealment of weapons of war”, and is being held in the Bolivarian National Intelligence Service (SEBIN), in The Helicoide building, in Caracas, in a cell of 6 square meters with no windows, and no access to sunlight. He is allowed to be at a parking lot every other week for an hour to breathe fresh air. His families provide food and water. Pena-Esclusa is now a cancer patient, with a prostate tumor removed a month before his arrest (June 11, 2010). His attending physician has been unable to examine or treat him since the surgery was performed a year ago. He requires -but is not allowed- postoperative radiotherapy treatment therapy, and he is awaiting a Venezuelan State order to conduct such treatment, but the order has not yet arrived. 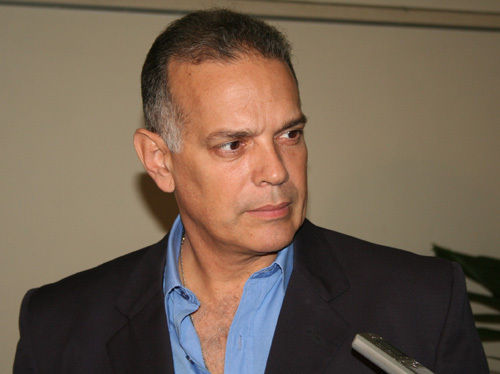 Church representatives, parliamentarians of several countries, writers and journalists, political leaders, and several international institutions have asked the Venezuelan government to permit a trial in freedom for Dr. Pena-Esclusa but still the Attorney General’s Office has not acted upon them.